I bought this really cute sleeper when Jakob was little and all 3 of the boys wore it! I love being able to get such good use out of all the boy clothes. 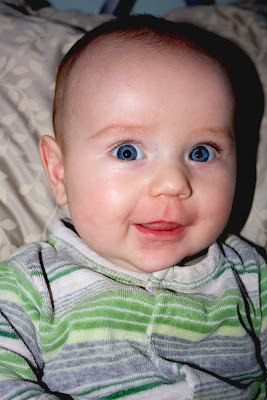 Here's Jakob at 5 months. And Zack at 3 months! Either that sleeper shrunk with each kid or each boy is bigger than the next!! I can't believe how different they each look! I didn't realize how different they looked either, until I put all the pictures side by side! It will be interesting to see how they all look at 3 and 6 and 10, etc.